Emotional Intelligence: Use It or Lose Your Career! You may think I’m exaggerating but it’s true. The #1 reason professionals stumble in their career advancement is because of their lack of social and emotional intelligence. They may have all the knowledge, skills and even years of experience but they have earned a reputation for not being able to get along with their colleagues, direct reports or even their bosses. In short, their own self-awareness; empathy for others and ability to manage their own emotions is limited or nonexistent. These folks (are we talking about you?) are just known for being difficult – they don’t listen, are confrontational, unpredictable and even arrogant in their beliefs. They may be in a supervisory or middle management position because they have been with the company for so long but now their career is on thin ice and they wonder why. But others know why . . . 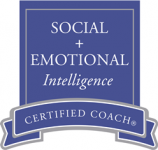 So what exactly is “social and emotional intelligence”? Here is a excellent working defination from the Institute for Social & Emotional Intelligence (ISEI), Denver, Colorado. “Social and emotional intelligence is the ability to be aware of our own emotions and those of others, in the moment, and to use that information to manage ourselves and manage our relationships”. I’ve been giving workshops on emotional intelligence (EQ) for years – it’s truly my favorite topic because it impacts every aspect of our working and personal lives. I’m delighted now to be in an intensive coach certification course (October – November) through ISEI with my Australian coaching colleagues to learn even more. I’ve already started to pull new ideas and tools into my training courses and with my individual coaching clients. So let’s remember that 80 – 85% of our career success at the upper levels depends on our ability to connect, communicate and collaborate with others. Our own personal work experiences confirm that research. We have all known industry leaders who have those qualities – they inspire, motivate and engage their teams and employees resulting in people working harder with energy, creativity and greater flexibility. The result? Less employee turnover; higher productivity and greater profits for the company. This is emotional intelligence competencies in action. Let’s be known as one of those leaders! There are at least a hundred personality assessments on the market today – all with the promise that if we know ourselves better we will be happier and more successful in both our personal and professional lives. We can take Emergenetics; the DiSC; the Myers-Briggs Type Indicator (MBTI); Skill Scan; StrengthsFinder 2.0; Career Liftoff; Knowdell’s Motivated Skill Sort; the traditional 360° Assessment; Personal Branding surveys; Emotional Intelligence self-assessments and the list goes on and on. But are they worth it? Can they help us learn something about ourselves that we didn’t already know? And how can we use the information to make our life a bit easier each and every day? What do I want to learn about myself? How will I apply that learning to my life today? The answers to these two questions may be more difficult than you think. That is why it is important to take the assessments under the guidance of a certified administrator that can clearly delineate the differences in the assessments, what you can expect to gain and then help you clarify how the resulting knowledge can benefit your goals at this time in your life. But what about all the on-line assessments? Yes, they have certainly gotten better in the last few years with many providing you with a robust report with more detail than maybe you even wanted. A word of caution – be careful of the freebies. You may be left with more questions, be more confused and more vulnerable for them to sell you a bigger package. Look before you leap! I am biased though and believe that nothing takes the place of talking with a real live professional that knows and cares about your own goals. I want to know that they really know what they are talking about. Over the years I’ve obtained certification in several of the well-known assessments. I weave them into the beginning of the leadership or career transition coaching that I’m doing and people love them. Maybe it’s the mystery of figuring out “Who am I really?’ or maybe it’s just trying to figure out what makes their husbands tick? My favorite is the Myers-Briggs Type Indicator (MBTI). It’s the best-of-the-best because once we know and really understand our own innate “preferences” life really does become much easier. And the icing on the cake, is now we know what motivates and energizes other people both in our families and in our work settings. We also become a little less critical and a lot more appreciative of the “gifts” we all bring to the table every day.